The Pittsburgh Penguins were involved in a 1-1 tie with the New York Islanders midway through the first period of their Feb.7 meeting at Mellon Arena and Maxime Talbot had seen enough. Frustrated by the fact that the division-rival Islanders were out-skating the home team, Talbot seethed on the bench. This is not the Max Talbot most people know. They know the charismatic, outgoing, and sometimes-goofy 24-year-old center from Lemoyne, Quebec who never seems to have an angry bone in his body. But on this night, Talbot was far from cheerful. He was mad. It is highly doubtful that Penguins' coach Michel Therrien would direct one of his players to do what Talbot did next. On his next shift, Talbot raced toward Mike Comrie, the early goal-scorer for New York, and the two dropped the gloves. The fight was a draw, but the spark from Talbot's actions seemed to awaken the Penguins and push them to a 4-3 win. Talbot logged 20:08 seconds of ice time in the game, but the five minutes he spent in the penalty box were probably Talbot's biggest contribution to his team's success that night. "Obviously, what you see is what you get with Max," said former teammate Colby Armstrong, now with the Thrasher. "He brings that to the rink every day. He plays with a great attitude on the ice. We can always count on that being out there. Watching his game and the way he works and some of the plays he can make actually surprises some guys. It's just a way he can make things happen." Overshadowed on a daily basis by superstar teammates Sidney Crosby and Evgeni Malkin, Talbot, his teammates, and those inside the Penguins organization know that what the third-year pro brings to the team cannot be easily replaced, if at all. Talbot usually plays center on the team's third or fourth line and his offensive numbers in 175 career NHL games aren't the stuff of legend (54 points), but he's clutch. His four game-winning goals were second on the team last season and he tied for third in the NHL with four shorthanded goals. As they say, the intangibles make the player and Talbot is full of them. Not least important of these attributes are his work ethic, his seemingly unending well of energy, and of course, the jokes. Ah, the jokes. "There are a couple of guys on the team that like to have fun a little bit," Talbot said, assuredly counting himself as one of those guys. "I try to show up to the rink every day with a smile on my face because obviously I feel fortunate and I've got my health. It comes from my parents. We're a really loose family and we're very open-minded and you know what, it's a great atmosphere. I'm fortunate enough to be there and I'm having fun out there. I mean, every morning I step on the ice, I feel happy." So happy in fact, that no one is immune from a little dose of Talbot comicality. One of his better-known gags took place at the pre-game skate in Toronto earlier this season. Out nursing an ankle injury, Talbot and his partner-in-goof, goaltender Marc-Andre Fleury, decided to have a bit of fun with the thousands of Maple Leafs faithful who showed up early to catch a glimpse of Sidney Crosby. Crosby had chosen to skip the workout, unbeknownst to the crowd at the Air Canada Centre. Talbot, unconvincingly, claims Fleury talked him into the act, but what came next was just Max being Max. "We got to the rink and I wasn't playing because I was hurt," Talbot said. "It was me, Fleury, (former Penguin Mark) Recchi and (goaltender Dany) Sabourin. We were just hanging out and we realized there were a lot of people at the rink. They were doing a promotion, an open practice." Talbot donned an official Crosby game jersey (not the usual non-numbered practice jerseys players wear during pre-game warm-ups), complete with the team captain's "C." The crowd erupted when they saw No. 87 take the ice, but after noticing Talbot's very un-Crosby-like skating, the duped crowd began to boo. Talbot was on the ice in the jersey no longer than one minute, but it was enough to draw the ire of some local sportswriters, though his teammates and home fans loved the joke. "It was just for fun, you know?" Talbot said. "I took a lot of heat for it, but it was nothing that was meant to offend anyone. I just wanted to make people laugh a little bit. Nobody else was even at the rink yet, it was just two guys out there and I skated around for a few seconds and people started cheering until they realized it wasn't Sid. We got a good laugh out of it, just a bit of fun." Hijinks aside, Talbot is a fierce competitor with guts, grit and above-average playmaking ability inside the offensive zone. Selected in the eighth round, No. 234 overall, of the 2002 Entry Draft, Talbot wasn't expected to be an instant contributor at the game's highest level. 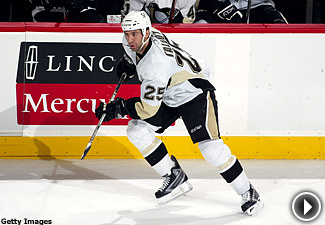 After another year in juniors, Talbot spent the NHL lockout with the Penguins' AHL affiliate, the Wilkes-Barre/Scranton Penguins, and filled many roles for Therrien, then head coach of the Baby Pens. With a productive pro season under his belt, Talbot was ready to make the jump to the NHL and he did so out of training camp the next year. Talbot shared his NHL debut on Opening Night in New Jersey with one Sidney Crosby. "Even though I didn't really expect to make the NHL my first year at 21, I came out of nowhere," Talbot said. "I remember being called into (then Penguins head coach) Eddie Olczyk's office and he said; 'You made the team.' You know, growing up in Montreal that's what you dream of, that's what you want to do." Talbot has flourished in Pittsburgh both on and off the ice. He's a bona fide fan favorite, an integral part of the team's system, and his teammates love him. "One thing about him, he's never afraid to say anything or do something stupid," Armstrong said. "Whether it's in the dressing room or whether we're out and about anywhere, he's a fun guy to be around." A fun guy, indeed. Just don't make him mad.